China is investing more money into research and development, helping it become a superpower in innovation. 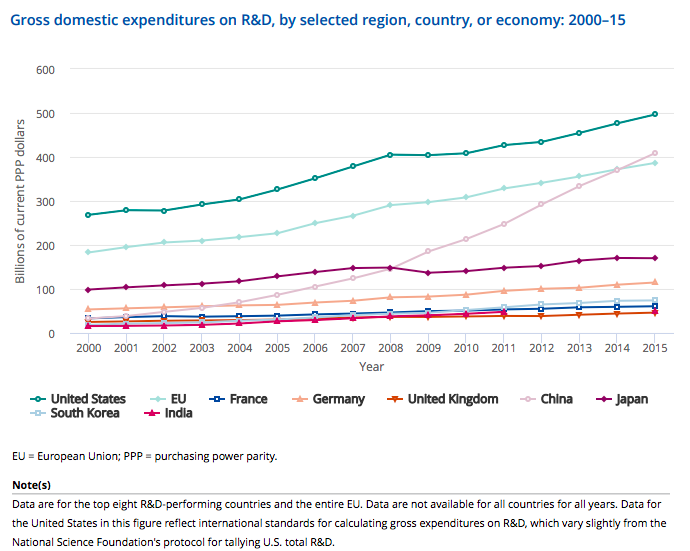 The light pink line shows China’s sharp increase in R&D spending. Research and development is an indicator of investment in technology and future capabilities, and therefore plays a critical role in the innovation process and the creation of new products, processes and services. Another key measure of innovation and technological advances is the number of students studying science and technology. Here too, China is excelling and has already overtaken the US, partly because of the size of its population. Between 2000 and 2014, the annual number of Chinese graduates in science and engineering went from about 359,000 to 1.65 million. Over the same period, the comparable number of US graduates went from about 483,000 to 742,000. 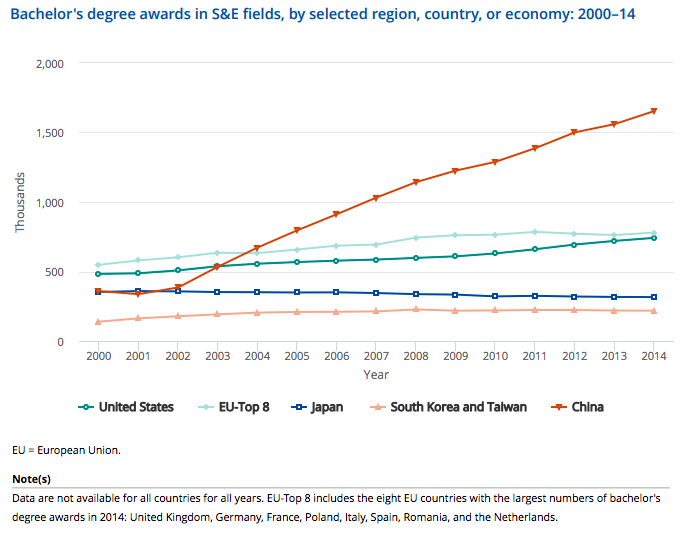 The orange line shows that China has more science and engineering graduates than anywhere else. An innovative, knowledge-based economy requires a workforce with high levels of science and engineering skills and an education system that can produce these workers in sufficient numbers, according to the National Science Board’s report. China’s new generation of scientists is also venturing into more demanding and high-tech areas, such as supercomputers and smaller jetliners, as well as its more traditional expertise in assembling sophisticated components made elsewhere. There are two other key measures of innovation: patents – which show the number of inventions; and venture capital – which provides the financial backing to turn those inventions into products. In both these areas, China is gaining ground, although still lagging behind the US. The patent market is dominated by the US, Japan and the EU. The US Patent and Trademark Office grants patents to inventors worldwide, with over 300,000 patents granted in 2016, primarily to the US, Japan and the EU. 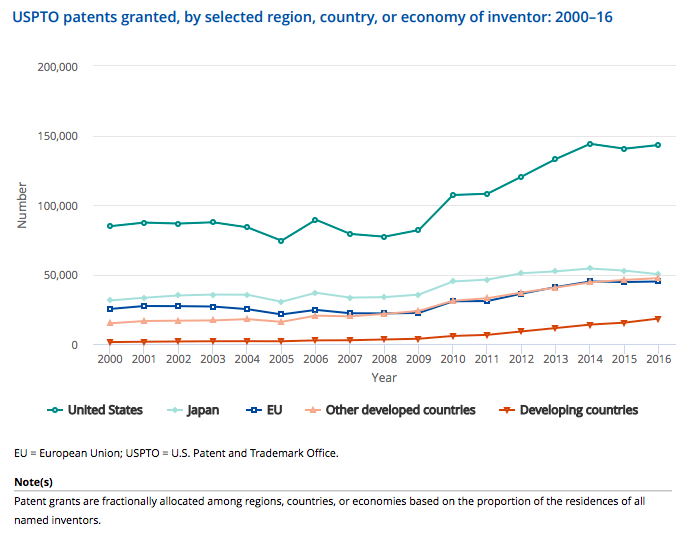 But US patents to inventors from developing countries have risen from under 1% in 2000 to 6% in 2016, with China (4%) and India (1%) accounting for the bulk of these. 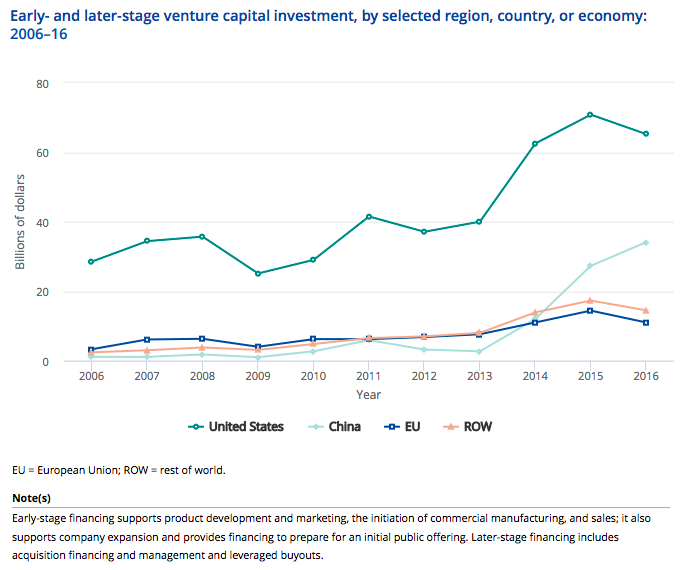 China’s share of venture capitalist funds is growing, while the US share is in decline. Access to finance – through venture capital investment – is the last piece of the jigsaw needed to spur innovation. The US attracted slightly more than half of the $131bn of the venture capital funds available worldwide. Nevertheless, its share of the pot is in decline while China’s share continues to rise sharply. Investment in China rose from a low base between 2006 and 2013, and then leapt from $3bn to $34bn in 2016. This means that China’s global share of venture capital funds has now risen to 27%.